Please call 903.838.5591 for current availability and to request a price list. 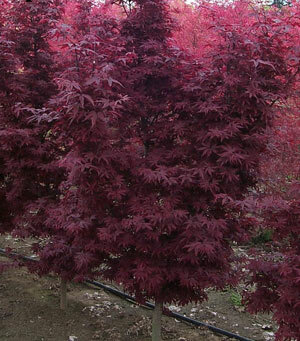 Bloodgood Japanese Maples have leaves that are a deep red and bold color well into late summer. 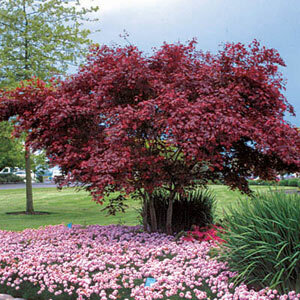 Upright, medium growth, broad crown, sun to partial shade. 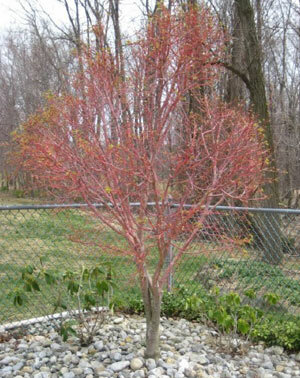 Often referred to as Coral Bark Maple, the bark on new twigs turns bright coral red after leaves fall. A very nice red palmatum, Fireglow tends to hold it’s red color in the heat better than the Bloodgood and other red palmatums. 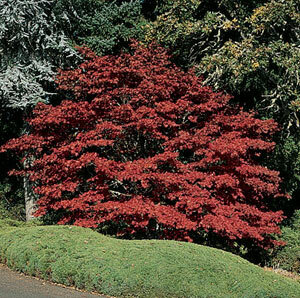 New growth on this vigorous, upright cultivar is bright pink-red changing to a bright red that is held throughout the summer without fading. Not as tall or widespread as the Bloodgood. Sun/part shade. 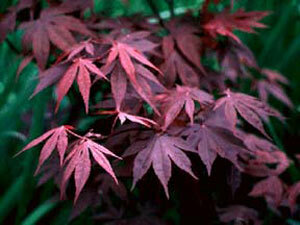 Leaves are a deep purple red which is retained throughout the summer changing to a dark crimson in the fall. Upright, rapid growth, wide – crown, full to part shade. A witches broom with small leaves. Lighter red in spring later turning dark red. Somewhat glossy appearance. Holds color very well in summer. Upright, medium growth, vase shaped.